“I’m going back to my office before the bomb goes off.” He walked down the hall to his desk, but before he sat down, he heard the enormous explosion that killed his boss. Because of intuition, that bombed didn’t kill Bob Taylor. Humor, particularly dark humor, is a common way to communicate true concern without the risk of feeling silly afterwards, and without overtly showing fear. This insight has haunted me most. Dark humour comes in part from a fear of embarrassment (that we would have made a bigger deal than needed) and a desire to appear courageous in the face of uncertainty — we choose “not feeling silly” over being safe. We are put in danger by our desire to keep up appearances. Using dark humour shows both our distrust for our intuition and our need to express it. Jokes are a way for us to get in the running for being right while making ourselves invulnerable to being wrong. The key message of this book is to trust your instinct. Trust that you are always responding to something, and that your intuition always has your best interest at heart — even if we don’t always interpret our instincts correctly. We must learn and then teach our children that niceness does not equal goodness. Niceness is a decision, a strategy of social interactions; it is not a character trait. people seeking to control others almost always present the image of a nice person in the beginning. Like rapport-building, charm and the deceptive smile, unsolicited niceness often has a discoverable motive. We are probably fundamentally good people, but our actions seem to come from a place with little bit of strategy and a little bit of justice (which includes the belief that we should be treated later the way we treat others now). With Women’s Day in the calendar, my reading list has been filled with notes on owning one’s own presence and sexuality, sassy feminists, and habits that are inherently sexist. Sidenote, the most cutting conversation around inherently sexist habits is regarding the “like a girl” comment — when girls are young, they are proud of doing things like a girl, but as they come into teenhood, doing things “like a girl” generally implies weakness, pickiness, bitchiness. Here’s the video. With Women’s Day in the calendar, I want to share a darker quote from The Gift of Fear. At core, men are afraid women will laugh at them, while at core, women are afraid men will kill them. The “Fear of Children” chapter was particularly intriguing — it focuses on the kind of violence that seems to come out of the blue and stuns us the most: children who gun down schools, stab babies, use suicide intent as leverage, and act in other violent ways with little emotion or remorse. Explaining how Judas Priest [the example death metal band] motivated the shootings, he [one of a two friends who went on a violent rampage and unsuccessfully tried to hold up his end of their suicide pact] said that he perceived the song “Hero’s End” to be about how one has to die to be recognised. By pointing his trigger finger at a rock band, James washed away all of the scrutiny that might reasonably have been focused on himself, his family, or even his society. On this note, I’d have to agree. There must be some inclination towards and desensitisation to violence that comes from following dark music, watching the news, playing violent games, and so on, but these are likely only the surface of the issue and often just a distraction. A person’s susceptibility and desire for violence is likely deeper nested in how they relate to the people and world around them. 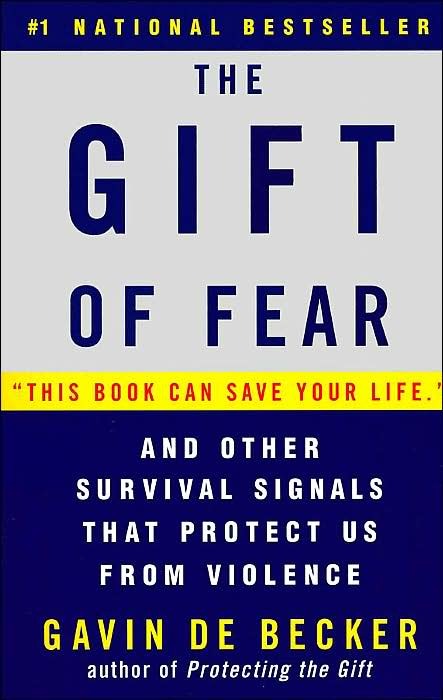 I picked up The Gift of Fear as a recommendation — I got the kindle version, without the “survival signals that protect us from violence” subtitle, without researching the author (who runs a company to protect individuals, and is a violence psychologist), so the direction of the book came as a surprise! I expected something about empowerment and fear in the face of human endeavours (failure, success, conflict, public speaking, death of a loved one, and so on), and read a book that is far more carnal, and initially, magnitudes more frightening. I’ve been posting about a personal fear daily for #30fearlessdays, and while I do have a pressing fear of dying in an accident, violence hasn’t come up. Part of that is the medium (we share #30fearlessdays on Facebook), and part of that is Singapore — there’s a sense of safety here, the kind of safety that puts risk and caution out of mind. Violence hasn’t any room in my brain space, but being reminded about its existence has made me feel both incredibly lucky and somewhat careless.